Stevia is a natural sugar substitute, derived from the leaves of an herb, and has been found to have negligible effects on blood glucose making it a great alternative to sugar for people who are sensitive to sugar or just want to cut back on sugar in their diets. I will admit to having tried stevia in the past with less than stellar results. 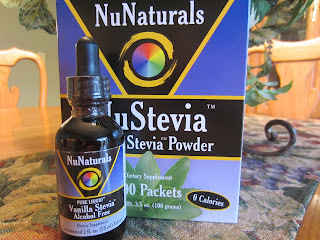 Many stevia products can have a bitter aftertaste...but I am thrilled to tell you, all the Nunatural products I have sampled DO NOT! Why are Nunatural products different from the rest? Because Nunaturals Nustevia is a superior stevia extract without the bitter taste that has been traditionally associated with stevia. Through an all-natural process, the bitter-tastng components are removed and natural flavors are enhanced providing you with the best tasting stevia products available. This is an actual muffin made with MoreFiber Stevia Baking Blend...it is also the one pictured in the original post! What I love about this product is that it is a one to one ratio for replacement. If the recipe calls for 1 cup of sugar, you can replace it with that much MoreFiber™ Stevia Baking Blend or just do a half cup of sugar and a half cup of MoreFiber™ Stevia Baking Blend . Each serving ( 3/4 TBS ) of MoreFiber™ Stevia Baking Blend has 15 calories and 3 grams of dietary fiber. Today I made a wonderful fall bread...Spiced Pear Bread. (The recipe will be posted later this week)! In this delicious and super moist quick bread, I replaced half of the sugar with MoreFiber™ Stevia Baking Blend. But I must give props to the other great products Nunaturals has to offer too! I have been using the Nustevia White Stevia Powder in my tea at night. It dissolves easily in any drink, warm or cold and is perfect for sprinkling on things such as cereal and yogurt. I have shared packets with friends, family and neighbors. Everyone has given this stevia product a big thumbs up. Although I don't usually sweeten my coffee, I have on occasion enjoyed using the Pure Liquid Vanilla Stevia. This product not only sweetens, but adds a touch of pure vanilla flavor to anything you use it in. It is very economical too...as you only need a drop or two because it is concentrated. Since it is alcohol free...it has a very mellow flavor! After sampling the Nunatural Stevia products...my mind has been changed. I believe in stevia now and you will too! NOW ON TO THE GIVEAWAY!! The wonderful people at Nunaturals have generously offered one 50 ct. box of Nustevia White Stevia Powder Packets AND one (2 oz.) bottle of their Pure Liquid Vanilla Stevia to FOUR lucky readers! YES....FOUR lucky readers will recieve both products FREE! 1. Follow MKA on blogger or on Facebook, if you don't already do so, and leave me a separate comment letting me know you added MKA. 2. Post about this giveaway on your blog, facebook status, or tweet about it on twitter and provide appropriate links to this post. Leave me a comment letting me know you did so. * I MUST be able to contact you to let you know you have won and so that your prize pack can be delivered. If you do not have a blog that shows a contact email I can contact you on, please include an email in your comment and a name( you can write out the (at) and the (dot) to help avoid getting spam) or send me your email address through my email ( mykitchenadventures (at) yahoo (dot) com) and let me know who you are and which comment is yours. Anonymous comments will not be included in the contest, unless somewhere in the comment you have left me a name and contact information. Contest is open to all Continental US residents only, sorry. No PO boxes please. This giveaway will end on Friday, September 23 at 8:00 pm EST. Winners will be chosen at random and will be announced either that night or the following day. Winners must claim their prize within 24 hours of notification, or a new winner will be chosen. But wait......EVERYONE IS A WINNER!! PLUS...if you place an order with Nunaturals online from now until September 30, 2011 you will receive a 15% discount off your total order. To get the 15% discount, just enter the code: BLG930 when ordering. You will also receive FREE shipping to the continental US on all orders totaling $35.00 or more! So go and visit Nunaturals and tell me what you think! i would try the Singing Dog Vanilla Beans... baked in cookies. I would like to try the pure liquid vanilla stevia in my morning coffee! I would try the pure liquid vanilla stevia in my muffins. I love making homemade muffins for my lil one's breakfast. Pure Liquid Vanilla would be so good in an iced coffee! I've used Truvia in baked goods, and it's fine, but I don't like it in coffee because of that bitter aftertaste you mentioned. Sweet Health, Erythritol Crystals would be great to try in all sorts of baking recipes! I would love to try the pure liquid vanilla...my bff loves it in her tea, to flavor homemade yogurt and other "plain" stuff! Thanks for a chance to win!!! This is so exciting! I've been dying to try the vanilla stevia b/c one of my fave bloggers (Chocolate Covered Katie) uses it in everything! That is definitely the product I'm most interested in, and I would use it to sweeten some raw desserts, like fudge babies! I would like to try the Singing Dog vanilla beans. I like to make my own vanilla using bourbon or vodka. I would like to try the Singing Dog vanilla beans to make my own vanilla using bourbon or vodka. I am a huge NuNaturals fan myself! Love those vanilla stevia drops in my FF Greek yogurt. Don't include me in the drawing as they sent me some free products already. Hi Renee, I'm in Canada, so can't enter, but wanted to say hi anyway. Hope you've had an excellent weekend. 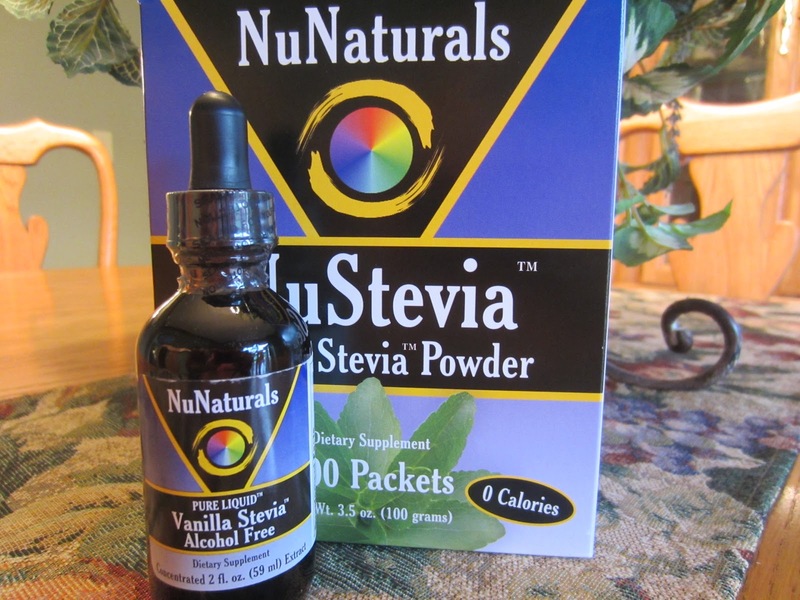 My favorite NuNaturals product is the pure stevia extract (powder). It takes such a small amount...I can sweeten an entire pitcher of tea with 1/4 tsp! Trying to get away from Splenda, and this might be just the ticket! OK, I'd really like to try the powdered NuNaturals stevia, too! Sweet!